Progressive Chat: What the heck is Brexit and why should we care? 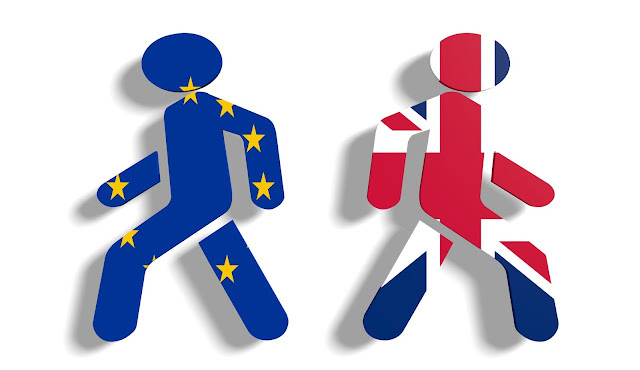 In simplest terms - Brexit is a Referendum on the United Kingdom's membership of the European Union. Asking UK citizens Leave or Remain in the union. What's the deal with the EU? The European Union - often called the EU - is an economic and political partnership involving 28 European countries. The EU was crafted after World War Two to foster economic co-operation, with the idea that countries with common trade interest are likely to avoid going to war with each other. The vote on the referendum was held on Thursday June 23, with final result being announced today. Leave won by 52% to 48%. The referendum turnout of 71.8% saw more than 30 million people voting. It was the highest turnout in a UK-wide vote since the 1992 general election. Let's dive into the numbers. With great disparity between phone and in person polls lots was said and typed about how demographics would want to Leave or Remain. Now that the votes have been tabulated we can see how the result may have been influenced by different concerns and backgrounds. 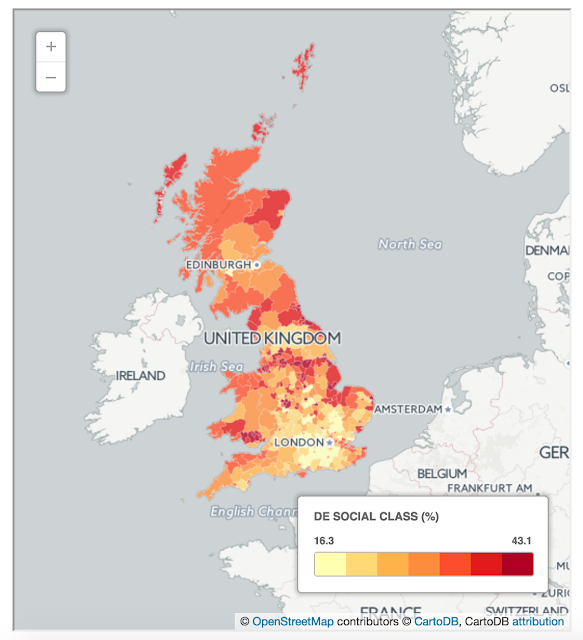 Much like in the US - Demographics appear to be destiny in the UK also. 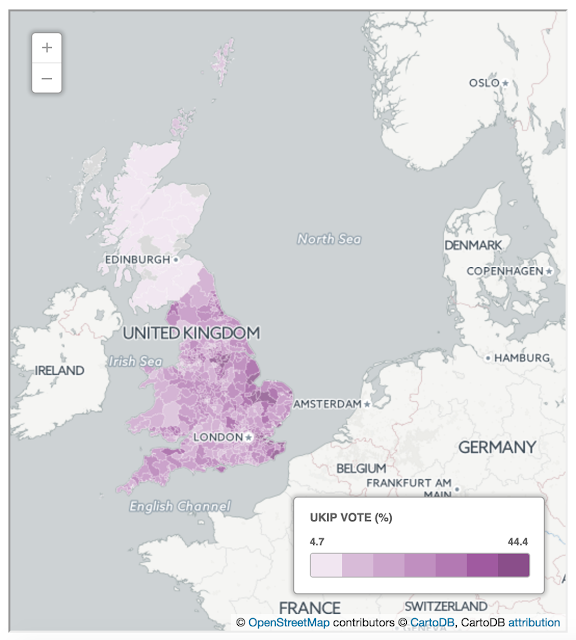 From age and class, to immigrant population and no surprise Ukip support (The UK Independence Party - a Eurosceptic and right-wing populist political party in the United Kingdom) vote, certain patterns kept indicating how each part of the UK were going to vote in the EU referendum. 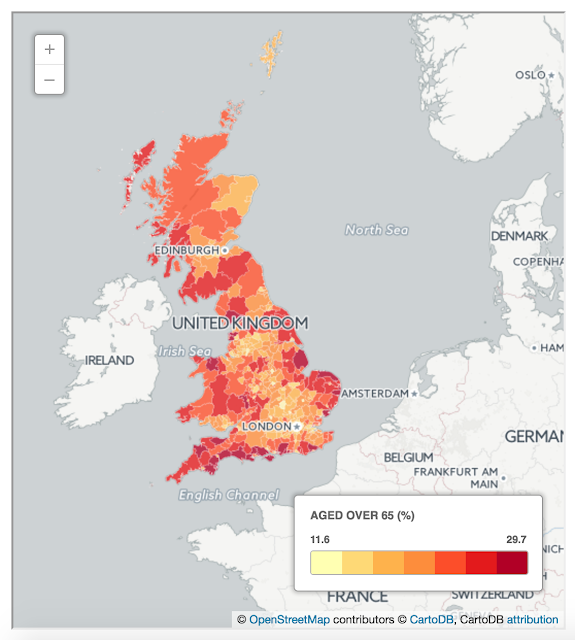 The Brexit vote overlapped strongly with the UK's older population. 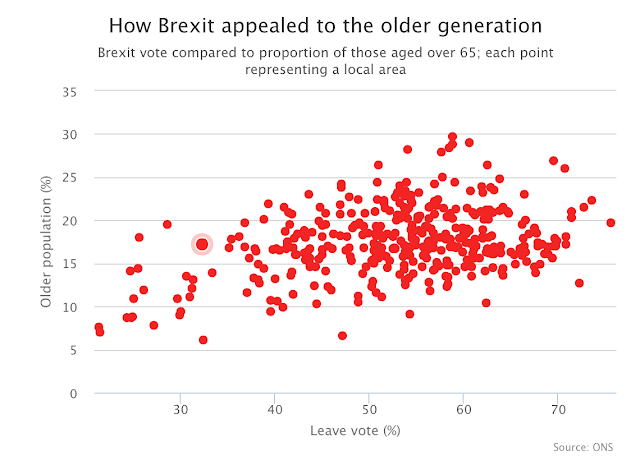 Those 60 years old or older were most the group to most likely to want to leave the EU. The East coast areas scored the largest amount of leave votes. They are also the areas with the highest retired population. The higher the level of education correlated with larger EU support. Polls showed university grads were the most likely people to want to remain in the EU. Those with a General Certificate of Secondary Education (GCSE) or equivalent as their highest level of education were more likely to back the Brexit. Class was also a key indicator in how one would vote on the referendum. 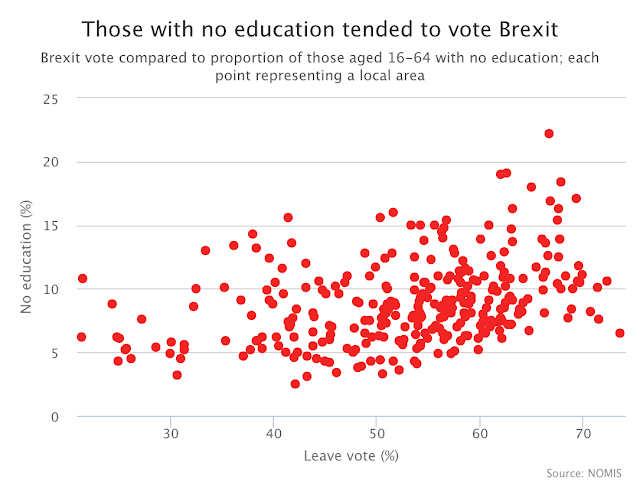 Levels of education and class are intertwined, so too was the Brexit vote. 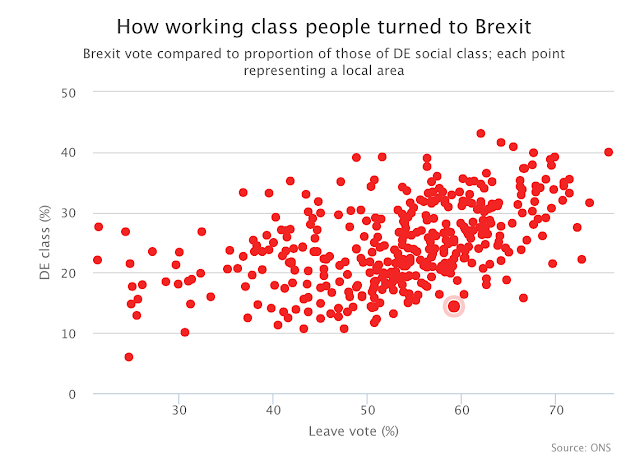 Areas with bigger numbers of working class and non-working people went with Leave. Last year's Ukip vote overlaps perfectly with Brexit support No one is surprised of course. Leaving the EU being the isolationist platform the Ukip was built on. Additionally, the party's leadership played a dominant role in the Brexit campaign feeling empowered by previous electoral success. In their sweet spot - the east coast - they garnered the highest eurosceptic vote followed the coastline. Areas with high immigration concentration wanted to stay in the EU. The Leave campaign used immigration as one of its key mobilizing arguments. Claiming that the current levels of net migration are too high. The Remain campaign resonated more strongly with Britain's immigrant population in a rebuke of the Britain first cries of those who favored Leave. In the urban hub and capital - London, where immigration is massively higher than the rest of the country, voted overwhelmingly to Remain - 60 percent to 40. So what does this all mean? Why is it a big deal? The standouts are geo-political, economic and social consequences. Leaving the EU means the travel restrictions the rest of the world face when visiting any EU country will now be part of any Brit's travel to EU nations. Millions of Brits who today could work anywhere in the European Union with ease will now need new permits and/or paperwork to continue to do so. Oh, see what you did there England? Under current employment rules, any player with an EU passport is free to play in the UK without restriction, while those from outside Europe must meet specific Home Office criteria which depends on how many international appearances they have made and where their country sits in the FIFA rankings. So, not only have you lost your Prime Minister, but you've also messed up your Premiere League Football as there are currently at least 332 players in the top two divisions in England and Scotland who would see their employment threatened after failing to meet the current standards. 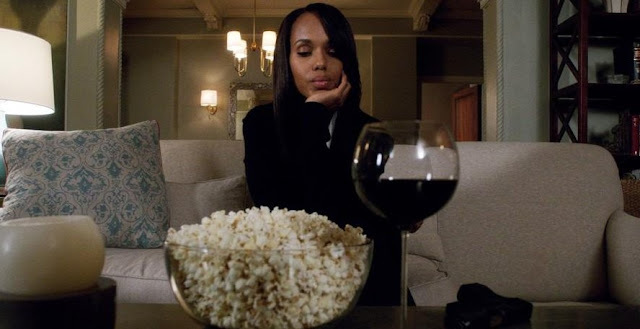 Then perhaps the most concerning - The social implications. It's terrifying to see this xenophobia and isolationism succeed in a once rational nation like Britain. Although the polls have been close - after MP. Jo Cox's (a very vocal supporter of the Remain cause) murder Remain looked likely to win out. We would be remiss to ignore the parallels in the demographics that brought Leave it's win and those we see in the US supporting The Donald. Older, the poorly educated, those who fear immigrants, and those who want to give a middle finger to the "establishment." As the dominoes are beginning to fall many today wish they could renege on their vote. Many saying "I never thought Leave would win. I just voted in protest!" Democracy isn't a game. 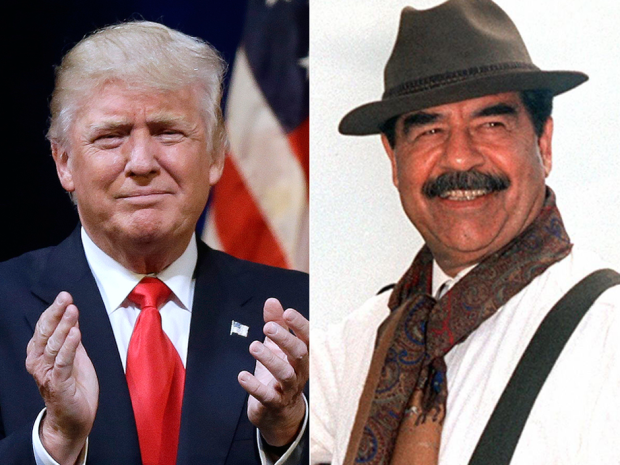 This Brexit vote should serve as an ear-splitting warning that while Trump would be detrimental to our national security , fear-mongers, incessantly lies, and has little funding for his campaign, he could become president of the US. This general election is genuinely the most consequential one in our lifetimes. We simply cannot afford to answer to our worst demons by following suit and electing Trump.